According to Alex Hirsch, creator of Gravity Falls, the second season of the hit Disney Channel series will premiere Friday, August 1 at 9:00 p.m. (ET/PT)! [quote]According to Alex Hirsch, creator of Gravity Falls, the second season of the hit Disney Channel series will premiere Friday, August 1 at 9:00 p.m. (ET/PT)! The second episode of the season will then premiere just three days later on Monday, August 4 on Disney XD. Going forward, Disney XD will likely be home of premieres first with Disney Channel airing encores afterwards. Season one premiered in June 2012 and ended last August. The nearly year-long wait has at least produced 17 short episodes (between two and three minutes each). Though, fans will certainly be glad to hear that the full 22-minutes of Dipper and Mabel goodness has finally returned! Last Monday's premiere of Disney's animated series “The 7D,” a contemporary, comedic take on the world of the Seven Dwarfs, delivered strong ratings on the ad-supported Disney XD. Disney Television Animation is in development on "Haunted Mansion," a special for Disney Channel and Disney XD inspired by the popular Disney Parks attraction. Disney XD's September premieres include Ultimate Spider-Man, The 7D, Gravity Falls, Lab Rats, Mighty Med, Boyster and more. Nerd Corps Greenlights Third Season of "Slugterra"
Nerd Corps Entertainment announced today that it has greenlit a third season (13 episodes) of its hit boys action property Slugterra, following a year of top ratings, toy sell-outs and new licensing deals for the brand around the globe. September 23, 2014 (VANCOUVER, CANADA) – Nerd Corps Entertainment announced today that it has greenlit a third season (13 episodes) of its hit boys action property Slugterra, following a year of top ratings, toy sell-outs and new licensing deals for the brand around the globe. The new season follows three Slugterra TV movies (seven half-hour episodes) that rolled out in 2014, including Slugterra: Return of the Elementals, which had a limited theatrical release in North America in August. The third movie, titled Slug Fu Showdown, and 17 new one-minute “slugisode” shorts are also currently in production, slated for fall 2014, and global rollout for all three movies on Disney XD and free-to-air is underway. This spring and summer, Slugterra became a top show on SABC in South Africa, Spain’s Clan TVE, the UK’s KIX, and Germany’s YEP!, among many more top ratings worldwide since the property launched two years ago. In addition, Slugterra toys have seen excellent sell-through in Greece, Croatia, the Middle East, South Africa, Latin America, Spain, Italy, the US and more. Slugterra launched on Netflix in the US in July, and the first two Slugterra movies—Slugterra: Ghoul from Beyond and Slugterra: Return of the Elementals—aired on Disney XD in the US in August. If your morning felt a little empty, it may be because for the first time in 50-some years, there were no Saturday morning cartoons on broadcast TV. While that news may not directly impact many viewers, it does deliver a gut-punch to our childhood memories. Over the years, Saturday morning cartoons have slowly been disappearing off the airwaves, leaving only one last block of animation programming—CW’s Vortexx, which over the years have aired Saban properties like Power Rangers: Lost Galaxy, Yu-Gi-Oh!, Yu-Gi-Oh! Zexal, Dragon Ball Z, Dragon Ball Z Kai, Digimon Fusion, Sonic X, and B-Daman CrossFire. Due in part to long-standing legislation requiring children’s educational and information programming, the availibility of streaming, and increased diversity in cable and satellite channels, this is the last door to close on an era that defined many of our childhoods. Fortunately, we still have our memories, our DVDs, and of course, plenty of online options. What were some of your best memories of Saturday morning cartoons? Let us know in the forums! Disney XD's November premieres include Star Wars Rebels, Gravity Falls, Phineas and Ferb, Pants on Fire, Wander Over Yonder, Kirby Buckets, Lab Rats and more! Disney Junior has ordered a second season of "Sheriff Callie's Wild West," starring Mandy Moore (Disney's "Tangled") as the voice of Sheriff Callie. Sheriff Callie’s Wild WestDisney Junior has ordered a second season of “Sheriff Callie’s Wild West,” starring Mandy Moore (Disney’s “Tangled”) as the voice of Sheriff Callie. The action-packed Western series follows Callie, a Calico cat sheriff who keeps the peace in her frontier town of Nice and Friendly Corners by ensuring that everyone abides by the rules of good morals, manners and social ethics. The first Western for preschoolers, “Sheriff Callie’s Wild West” charted new territory when it premiered on the WATCH Disney Junior app in November 2013. The first series across Disney|ABC Television Group to premiere multiple episodes online and on mobile devices before its television debut, it amassed over 23 million views. The series then launched on the 24-hour Disney Junior channel in January 2014 and year-to-date is the #1 series across preschool-dedicated TV networks in Kids 2-5. Additionally, its back-to-back premiere telecasts remain the network’s Top 2 telecasts of all time in Total Viewers. Disney has ordered a second season of "The 7D," the hit animated TV series which takes a comedic look at the world of the Seven Dwarfs. “The 7D” currently airs daily on Disney XD in the U.S. and beginning Friday, December 26, will air weekends during the Disney Junior block on Disney Channel. The series is also set to debut in early 2015 on the Disney Junior channel. “The 7D” has premiered in Canada, France, Spain, Italy, Russia, Israel, Southeast Asia, Taiwan, Hong Kong, Korea, Japan, India and Latin America and will continue to roll out globally throughout 2015. Disney Junior's "Miles from Tomorrowland," an intergalactic adventure series, blasts off FRIDAY FEBRUARY 6 on Disney Channel (9:00 a.m., ET/PT). Stellar Voice Cast: Olivia Munn, Adrian Grenier, Mark Hamill, George Takei, Bill Nye, Wil Wheaton, Alton Brown and Brenda Song. Series premiere: Friday February 6 @ 9:00 A.M ET/PT on Disney Channel. 4 episodes back to back. It incorporates unique space and science facts into the storylines that chart the outer space missions of young adventurer Miles Callisto and his family as they help connect the galaxy on behalf of the Tomorrowland Transit Authority. "Penn Zero: Part-Time Hero" is set for a simulcast premiere February 13 on Disney XD and Disney Channel. 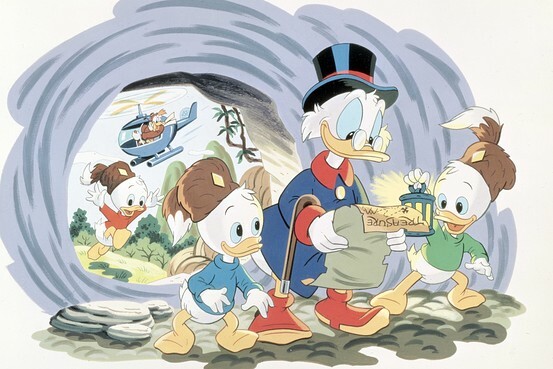 In addition to main characters Scrooge, Huey, Dewey, Louie and Donald, there will be several familiar beaks returning to the “DuckTales” fold: Duckworth, Gyro Gearloose, Launchpad McQuack, Flintheart Glomgold, Magica DeSpell & Poe, Ma Beagle and the Beagle Boys (Burger Beagle, Bouncer Beagle), Mrs. Beakley and Webbigail “Webby” Vanderquack. Since we must bide our time for two years until the new “DuckTales” episodes are ready, feel free to catch up on/binge-watch the original “DuckTales,” currently available on WATCH Disney Channel, an app that allows consumers to watch on tablet, phones, computer and set top boxes. Or, you could check out this music video featuring “DuckTales” theme song – and a re-creation of the show’s opening sequence with real ducks. The clip has amassed over six million views since September 2014 on the YouTube channel Oh My Disney. I’m really enjoying this USWW Spider-Verse special event on Disney XD. You never know what to expect. Future World, Women’s World, Noire World and Farm World so far. Spoilered the universes for those that haven’t seen it. So excited for Part 3. Looks to be even weirder. The Disney Channel in Japan will begin running the first season of the Love Live! anime on April 20. The series will run every Monday through Thursday at 9:30 p.m. and 24:30 (effectively 12:30 a.m. the next morning). The Disney Channel is also listing Love Live! among its recommended shows for April. 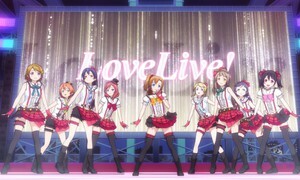 In 2010, the anime studio Sunrise, Lantis, and ASCII Media Works’ Dengeki G Magazine launched Love Live! as a self-described “ultimate user-participation project” which lets its fans vote on the future of the fictional idols. A series of music CDs and animated music videos then followed. The members of the project announced in 2012 that an full anime series had been green-lit for the following year. The second season of the anime was announced in June 2013. A film will open in Japan on June 13. Crunchyroll streamed the series as it aired in Japan, and NIS America has licensed both seasons for North American release.